Leon Liu coined the term “Open Source Learning” in 2006. The term embodies two major visions. The first vision is that for internet to truly change current education system, we have to open up the “source” of learning, which is at the core of digitization of knowledge and learning. Software is about digitization of human world. However, the digitization of knowledge and learning hasn’t been successful in the past. The key, according to Leon, lies in the digitization of the source of learning, which is the Significant Experiences (a term also coined by Leon Liu). Significant Experiences are any experiences that can have a significant impact on one’s understanding of things that one is interested in learning. Open Source Learning is aimed to open up that source with software powered by Knowledge Engine, which can take Significant Experiences as inputs and transform into higher level knowledge structure and thus any knowledge related activities such as learning, peer learning, instructing, writing a blog article, book writing, project management and so on can be done smoothly based on knowledge digitized. The second vision is that such software has to be built in the open source way. It shouldn’t be proprietary software or private efforts by companies or other organizations. The public software infrastructure has to be built up in the open source way to empower the Self-Directed Education movement that is already underway. Software industry has to put great efforts in absorbing the rich experiences that the alternative education communities have accumulated for decades, especially experiences from Sudbury schools, Summerhill school and other democratic schools or learning centers, and from unschooling practices. A range of Open Source Learning software, built on top of the core Knowledge Engine, will be the infrastructure of future learning. For example, they can be used in the learning centers as part of the infrastructure of those learning centers. Open Source Learning is about learning in all ages including children and adults. Open Source Learning subscribes to Sudbury Model as embodied by sudubry schools, and strives to expand the self-learning model of it to all people including adults. Yes, self-learning is for all people. We are all self-learners! Let’s make self-learning a bit easier! Everyone can become a teacher, and in the future, the talented professionals should be the source of teachers. Teaching/instructing will be made easier by Open Source Learning software and thus professionals who really possess the knowledge can find it very easy to teach and become a teacher and make a living from it, and these teachers should never be separated from their professions so they keep get updated with new knowledge and also new and deeper understanding on their knowledge. The educators have to be strong learners themselves and be at the frontier of learning practices. Why the education system has been so resistant to change? One major reason is that our educators or professors in education schools don’t have many learning experiences themselves. This should change in the future. Education is not difficult if you are a strong learner yourself and you pay attentions to the thing called “education” over a period of time. Knowledge and learning paths constructed through software powered by Knowledge Engine can be used to demonstrate one individual’s learning and it can be used as an essential part of one’s portfolio to be evaluated in job hunting, effectively replacing the standardized testing that is at the center of current education system. The rich production of knowledge through Open Source Learning software will make the whole society a comprehensive learning environment. It will be very easy to find people who share the same learning interests as yourself. Also various institutions or organizations such as physicians’ clinics or lawyer’s law firms can be opened up to educate the public in its field, such as health or law. These institutions or organizations become part of the educational infrastructure for the society. Play first! Playing is the primary activity, and learning is the secondary activity. We learn only because we want to play better. Learning should never be separated from real life and from playing. Software made by Open Source Learning makes it easier to learn while playing. The mobile internet has made it easier for us to use our fragmented time and thus suddenly people feel the challenge of learning with fragmented time. But here at Open Source Learning, we think it is not a problem of fragmentation, it is a problem of the traditional schooling that has made real life learning difficult. The mobile internet just made acquiring the skills of Real Life Learning more important. The emphasis on the “source” of learning means emphasis on “understanding” of knowledge and on self-reflection skills in learning. Knowledge comes from within. With strong self-reflection skills, fragmented time will not be an issue and learn while playing is thus possible. Open Source Learning software helps people train self-reflection skills and habits. One major task of Open Source Learning is to be the bridge between self-learning communities (unschooling, free schools and learning centers) and software programmers, introducing to software programmers the rich experiences on learning/education from those self-learning communities for the purpose of deep innovation in the education/learning space and building up of software infrastructure for self-learning. Software programmers should seek nowhere else for sound learning/education theories for their software design. The true understanding of education/learning is not in the education schools of universities. In addition to that, as mentioned above, it is not difficult to understand learning/education if you are a strong learner yourself. Just pay attention to the learning process while learning. Furthermore, software programmers have an unique advantage that they can test their ideas with code. It is social science that can be executed and tested. Software programmers are exploring social sciences such as education with their software. By listing these visions, we don’t claim originality in coming up with them. We recognize that there can be many others around the world who share similar visions, and we recognize that there are important thoughts that have influenced us. By listing these visions, however, we want to propose that these visions will play key roles in leading to future learning/education and we call for attentions and actions from the alternative learning communities and from software programmers. To learn of our current progress, here is summarization of our findings. 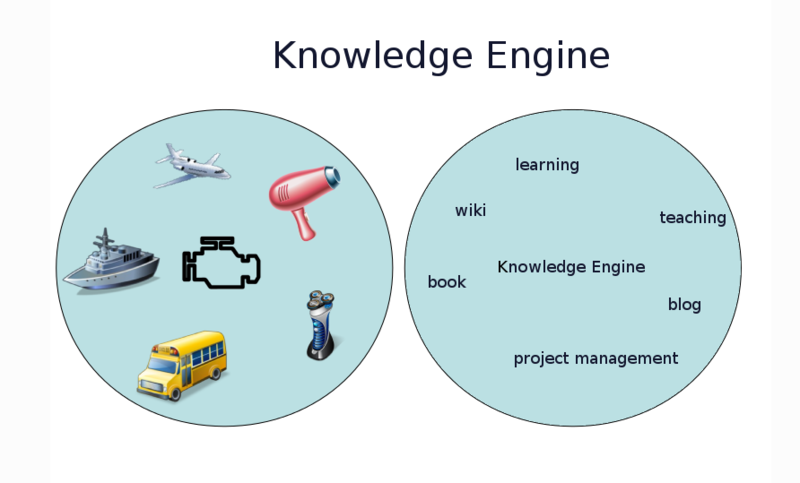 You can read the essay on Knowledge Engine, and you are welcome to try out the self-learning platform, powered by Knowledge Engine. Start noting down your significant experiences and see how that helps you learn. If you are interested in working on the Knowledge Engine project, you can visit our github page. The planning of Knowledge Engine development are shared publicly and can be viewed in the learning group “notebook”. You should be able to see the visions, ideas, planned features, current development, bugs to be fixed or already fixed, and so on in its group notes. Notebook group is used to coordinate and share notebook development publicly. We are all self-learners. Make self-learning easier! Make real life learning mainstream learning in the future! Explore, Experience, Express. Let’s bring out the true face of learning! Any questions, please contact me: sys @ opensourcelearning.org or leave a comment below. not very sure of how to use this software tool, but very interested to have a try! Thanks! Would love to hear your feedback! We think the content of this wikipedia entry needs major enhancement. However, we do share the vision that Open Source Learning is about “Opening up the source of learning” and hope more people can join such efforts and believe this will truly tap into the potential of internet for changing our education system.